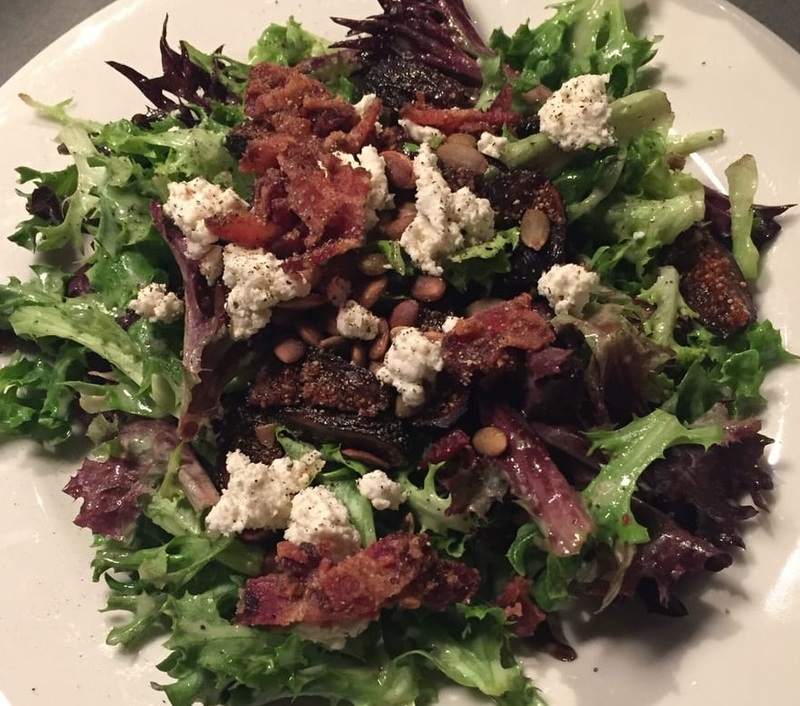 Here’s my best attempt at reproducing the outstanding Harvest Salad, a seasonal specialty at Dewey’s Pizza in Cincinnati. I was in Cincinnati for a few weeks and ate one of these every other day! (They make terrific pizza as well). *Rather than go with the sliced figs in the original salad, I just added 2 Tbsp of fig butter (from Trader Joe’s) to the vinaigrette, since I happened to have some. I thought it was as good, if not better. If you happen to have fig jam, you could use that too, though I would use less honey as the fig jam has more sugar than the fig butter. 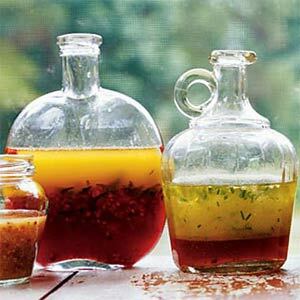 Home-made vinaigrettes are so much better than even the best store bought ones that it seems silly not to make them yourself. Especially when they’re this easy. All of the following vinaigrettes have about the same proportions: 1 part vinegar to 3-4 parts oil. I usually go with 1/4 cup vinegar to 3/4 cup oil. They all get salt, pepper, and maybe a pinch of sugar or honey if you like them with a little less bite. Just whisk together in a bowl and you’re done. I like extra virgin olive oil, but in some recipes you don’t want a strong olive taste. You can blend olive and canola to taste, depending on how strong flavored your olive oil is. Any of the first three vinaigrettes (Dijon, balsamic, walnut) are good on just about anything. Good for mesclun kitchen sink salads with fruits and nuts etc. Baby spinach with a fresh lemon and peanut dressing, topped with Feta cheese, bacon bits, and crispy shallots. Romaine lettuce tossed in a balsamic pesto vinaigrette, with sliced Granny Smith apples, toasted pecans, red bell peppers, blue cheese and croutons. 1. Rinse chicken and marinate in ¼ cup of pesto dressing. Chicken should be at room temperature before cooking. 2. Cut off stems and remove outer leaves of romaine lettuce. Tear into chunks and place in a bowl or container in the refrigerator with a damp paper towel or dishtowel over the top. 3. Preheat large frying pan. Remove chicken from marinade and pat as dry as possible with paper towels or a clean dishtowel. 4. Add a thin layer of olive oil to coat bottom of pan. Add chicken breasts, leaving space between them so they don’t steam. Cook on high until cooked a little more than half way through. Lower heat if the oil starts to smoke. If there is liquid in the pan, keep heat high and keep pan uncovered to evaporate. If pan is dry, add a little more olive oil. Note: Don’t move the chicken around in the pan. When it is done cooking on a side, it should release from the pan without sticking. 5. If it has cooked a little more than half way through, add a little more oil to pan and flip chicken over onto oiled surface. Depending on how thick it is, it should only need to cook a few more minutes on the other side. 6. When chicken is still a tiny bit pink in the middle, remove chicken from pan and place on a plate. If using a meat thermometer, take the chicken out of the pan when the internal temperature reaches 160 degrees. Cover with foil and let rest for about 5 min. 7. While chicken is resting, take romaine lettuce out of fridge, add apples, pecans, pepper strips and blue cheese, and toss in pesto dressing. Add salt and pepper to taste. 8. Cut chicken breasts into strips. 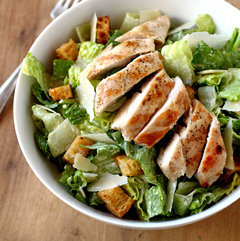 Serve salad, top with chicken strips and croutons. Perfectly seared sliced steak served with crispy iceberg lettuce and homemade ranch dressing, with bacon, blue cheese, red onion and croutons. This traditional Greek Salad is a nice change of pace from your everyday side salad, while being just as easy. Start with my simple Greek Vinaigrette. The vinaigrette already has plenty of lemon, garlic and oregano. You can also skip the lettuce and go with larger slices of tomato and cucumber. Just let them marinate for a few minutes in the vinaigrette. 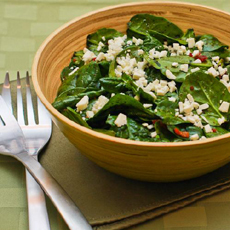 My Lemon Peanut Vinaigrette is specifically made for this non-traditional spinach salad. I have tried frying the shallots myself, but pre-fried onions are much easier. 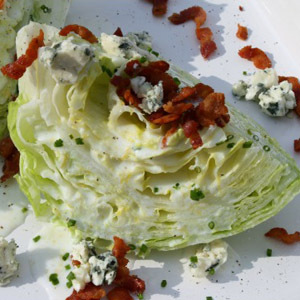 This is a nice light salad, but if you feel the urge to add cooked bacon bits, go for it. I used to like eating the leftover vegetables that sat at the bottom of the salad bowl after dinner. 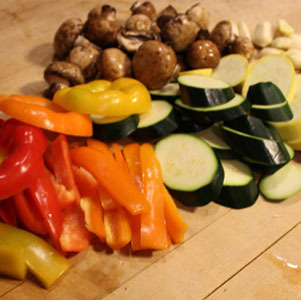 After marinating in salad dressing, these vegetables were salty, crunchy and delicious. Later I decided to just skip the original salad and just make a huge bowl of marinated vegetables. Yum. Ideally you want all the vegetables to be crunchy but not totally raw after a half an hour of marinating. Some vegetables could do with a quick blanching in boiling salt water. Some, like green beans, should be actually cooked. If you slice harder vegetables like carrots thinner, and softer vegetables like zucchini thicker, they’ll all come out about the same. Any basic vinaigrette works for this salad, but I particularly like it with Walnut Sherry Vinaigrette. Combine veggies and vinaigrette, except for avocado and lettuce, and let marinate for 20 min or more. Toss greens in dressing. Top with vegetables. 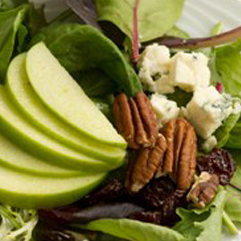 Toss avocado in dressing and place on top. You can do just about anything with this salad. You could add fresh mozzarella, artichoke hearts, grilled asparagus, roasted beets, kidney beans or even cooked shrimp. But I just like to grab whatever I have around and make myself a big bowl of crunchy goodness.